The idea for the G690 came to Fuji from its discussions in Japan with commercial photographers, who were doing a brisk business in color photographs of tour groups that the tourists would buy as mementoes. Medium or large format was preferred over 35mm, for which emulsion quality was not always satisfactory and which had an unneeded number of frames per roll. However, the photographers envied the ease of handling of 35mm rangefinder cameras. Fuji determined to produce a camera for 120 roll film whose handling would approach that of a Leica. It took the 70mm Combat Graphic as a model for what could be done, and put Yamamoto Katsuhiko (山本勝彦) at the head of the design team. While Yamamoto acknowledged that the new camera would not need the weatherproofing or degree of ruggedness of the Combat Graphic, he thought it should still be designed for hard use, and that the goals of durability and ease of handling should take priority over frills such as an exposure meter. The G690 was exhibited in prototype form as early as the March 1968 Tokyo Camera Show. The prototype has a dial on the front (close to the front shutter release of the much later GL690) for switching between 6×9 and 4.5×6; this feature was dropped before the camera was produced, and the number of brightlines shown in the viewfinder reduced to the two for 100mm and 150mm, thus avoiding both the low magnification needed for inclusion of a 65mm brightline and an irritatingly small brightline for 180mm. 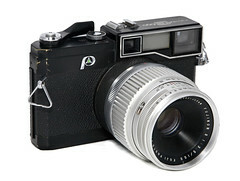 The Fujica G690, shown in Photokina in September 1968 and released in Japan in December 1968, is a 6×9 interchangable-lens, leaf-shutter rangefinder camera. It looks rather as if a Leica M3 with a particularly large lens (perhaps 85mm f/1.8) had been made to a much larger scale: it is 187mm wide, 119.5mm high, and (with its 100mm lens attached) 147mm deep. The body alone weighs 1258g; the 100mm lens 744g. The camera is designed to be about as close to a (large) 35mm rangefinder camera as a leaf-shutter medium-format film camera can be. The back simply hinges open (there is no separate film back), and in order to change lens in mid-roll there is no need for a dark slide (one turns a knob to engage an internal curtain). Film advance is automatic: once the "start" line on the film backing paper is lined up with the dot on the film rail, one closes the back and alternately winds until the film stops, and fires. There is no separate shutter cocking lever. Winding employs a lever positioned and shaped much like that for a modern 35mm camera; advance from one frame to another needs two strokes, first of 180° and secondly of about 160°, the exact angle depending on the effective diameter (including film) of the take-up spool. The shutter release button is coaxial with the film advance lever; at its centre is a thread for a standard cable release. The rangefinder is coupled and has a baselength of 67mm. It is integrated with the viewfinder, whose magnification is 0.75 for an effective baselength of 50.3mm. The viewfinder has projected framelines for the 100mm and 150mm lens. The viewfinder is superior to that of most other rangefinder cameras (even the Leica M series) in that it is field-corrected: as the lens is focused, the brightlines adjust not only for parallax but also for field of view. The eyepiece is rectangular with a lip that seems designed to take accessories; Fuji sold an eyecup but it is not known whether dioptre lenses, a right-angle finder, etc., were also available. Toward the bottom left of the finder, a red dot appears in order to warn when the film-plane curtain (designed to screen the film while changing lenses) is closed. The viewfinder image, rangefinder image and brightlines appear about 1.25m, 1m, and 1.4m away respectively. One oddity for a newcomer from 35mm is the layout of controls on the lens. Moving outward from the body, the rotatable rings on the lens are first the breechlock (like that for a Canon FD lens), then focus, aperture, and finally shutter speed. The aperture ring has equally-spaced whole-stop detents, and it is easy to hold both the aperture and shutter speed rings simultaneously between thumb and forefinger in order to move quickly between such same-exposure combinations as f/11 at 1/60 and f/16 at 1/250. The camera takes 120 film, 220 roll film, or 6.5×9cm (in Japanese 大名刺, daimeishi) sheet film. Roll or sheet is selected by a switch on the back with positions for "R" and "S"; this must be set at "S" for dry-firing. To change between 120 and 220 one turns a dial at the top of the camera and also turns over the film pressure plate (clearly marked "120" on one side, "220" on the other). The camera has a cold shoe; there is a PC terminal on the lens, with a switch between X and M synchronization. The finish of the body is black, with a small amount of silver trim around the view- and rangefinder. On the front is a mark that might be a stylized "P" for "professional" (suggested by the way in which the "P" disappeared on later models that were marked "Professional" elsewhere). Complete with its standard 100/3.5 lens, the camera weighs 2015g — compare 2300g for the Pentax 6×7 with its 105/2.4 lens, released one year later — and was priced at ¥78,200. Fujica G690BL, Fujinon 100mm f/3.5 black lens. The main improvement of the Fujica G690BL, released in October 1969, is a lock to prevent lens removal unless the curtain has been closed. Other substantive changes are a redesigned control for opening and closing the curtain, and an improved lock for the back. 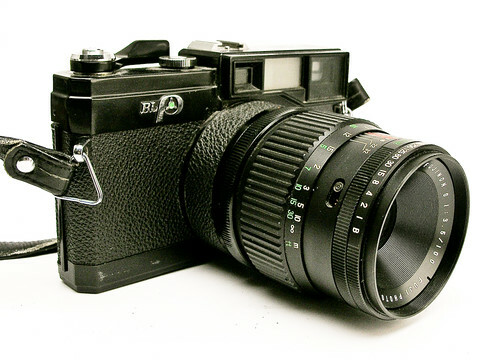 The lenses are now finished in black and the silver trim was removed from the body, marked on the front "BL", where "B" stands for "Black" and "L" for "Lock". In Japan, the G690BL was released as a set with the 100mm lens, for ¥86,600. According to Koyasu its weight is the same as that of the GL690, to the nearest gram. Design of a successor to the G690BL started quickly. Yamamoto, the designer, was joined by Mr Hamada (浜田寿), as planner; and the two of them spent much time talking with professionals throughout Japan. The result, the Fujica GL690 Professional, was released in January 1974. A second shutter button is added on the front for ease when the camera is held vertically. Finder magnification is increased from 84% to 92%. Cosmetic changes are the addition of "Professional" at the top and the disappearance of the "P"-like mark on the front; and the appearance of a large white stylized "G" on the top of the lens mount. The focussing grips on the lenses are now rubber. A 50mm lens, a faster (f/5.6) 65mm lens, and an autoexposure 100mm f/3.5 lens were released at the same time as the GL690. The body cost ¥53,400, plus ¥1400 for a strap and ¥200 for an eyecup. In combination with the regular 100mm lens, the GL690 weighs 1745g (part of the weight saving is in the lens), and was priced at ¥140,400. Provision of the autoexposure lens, and a continued commitment to simplicity, meant that two prototypes were abandoned. One had a CdS exposure meter, with its sensor on the front of the body and a readout in the viewfinder; the other, date-recording capability. 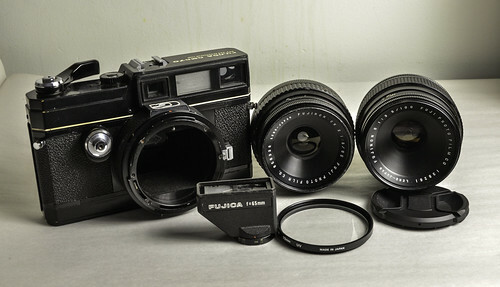 The Fujica GM670 Professional was released at the same time as the GL690. Although for 6×7 exposures, it is just as large as the GL690 and differs only in having a smaller film gate and different gearing and numbering for the film advance mechanism. The body cost the same as the GL690: ¥53,400. In Japan, the GM670 was released at about the same time as the AE 100mm lens, and for this reason the combination was more often reviewed than the others. The set weighs 1840g, and was sold for ¥147,800. This table does not distinguish between the silver-finish lenses released in 1968 and those in black released in 1969 (both have ribbed focusing rings). The lenses released in 1974 have rubber-coated focusing rings. The lenses all seem to be calibrated in both metres and feet. When the photographer holds the camera, infinity is at the anticlockwise extreme: one turns the focussing ring clockwise to focus closer. All these lenses have Seiko no.0 shutters with B and a top speed of 1/500; for the AE 100mm lens, the slowest speed is 8 sec, for the others 1 sec. Filter thread is 72mm for all lenses; the AE lens has a push-on hood and the others have screw-in hoods. Supplementary notes on some of the lenses follow. The 50mm f/5.6 lens was particularly highly regarded. Fuji also produced a few dozen of the same optical design for standard view camera lensboards. The 100mm lenses are commonly described as of Tessar design; the 150mm and 180mm as of Sonnar design. Various websites mention a 250mm lens, but no evidence ever seems to be adduced for its existence; authoritative sources do not mention it. The AE lens has an electronically governed shutter and an exposure meter — not TTL, but (like such 35mm rangefinder cameras as the Konica Auto S2) via a cell positioned behind any filter that might be screwed into the lens. As viewed by somebody being photographed, the lens appears to have a box stuck to its left-hand side, a box that announces "AUTO ELECTRO" and has a screw-in battery cover. The top of this box shows the needle of the meter, when activated by the shutter-speed check ("SSC") button. However, the purpose of the lens is that its shutter speed can be set to "A" (auto), whereupon the photographer enjoys aperture-priority automatic exposure. When the battery is dead, or the electrical circuitry is not working, the lens has a fixed shutter speed of 1/500. Film speed can be set within the ISO range 25–800. The lens cost ¥83,000, the hood for it ¥2,000. The electronic circuitry is now (2006) of course three decades old. But unusually for the time, the battery is silver rather than mercury; and the electronics are reputedly simple and robust. As mentioned above, Fuji sold a neckstrap, eyecup, dioptre lenses, and right-angle eyepiece attachment. A close-up attachment was available for the 100mm lens: a supplementary element for the front of the lens, and correction for the finder. A sports finder has an external frame and two internal frames, for 65mm, 100mm and 180mm. It cost ¥5,500. An additional accessory shoe was provided, for attachment to the eyepiece. A flashgun (GN32; marketed in Japan as "Fujicolor Strobo Professional"), actually made by Kako, cost ¥31,000 with bracket and cables. An additional flash bracket (in Japan, "strobo bracket G") was also available, as were a quick-release tripod mount, the "Q Setter", and a large bag, the "Fujica Carrying Bag II". ↑ Nawa, Meiki o tazunete, 256; Koyasu, "Fuji Shashin Firumu no kamera no subete," 68. ↑ All Japanese personal names in this article are in the Japanese order: surname first. ↑ Nawa 257. In the first impression of this book, the photographs of the production G690 and 6×4.5 prototype G690 are accidentally switched. ↑ Dimensions and weights: Asahi Camera March 1969, 263. ↑ Eye focus point: Asahi Camera, March 1969, 264. ↑ The meaning of "BL": Nawa 258; Koyasu 68. It is hard to believe that "BL" stands for "Breech Lock", as is confidently stated on some web pages: the earlier G690 has just as much of a breech lock as the G690BL. ↑ On the development: Nawa, pp.259–60. ↑ Japanese-language GL690/GM670 manual (dated June 1974), p.29. ↑ Advertisement for GM670, Nippon Camera March 1974. ↑ Prototype with exposure meter: Nawa pp.259, 260. Date-recording prototype: Nawa p.261. ↑ Finder magnifications for 50mm and new 65mm lenses, Japanese-language manual for the GL690 and GM670 (dated June 1974); other finder magnifications, Asahi Camera, March 1969, 264; other information, Koyasu 73. Koyasu does not provide block diagrams; Lallement provides them here for the lenses released at first, and states that the 65/5.6 lens has the same formula as the 65/8, which is incompatible with what Koyasu writes. ↑ According to Lallement (page on lenses), this is the same finder as for the 50mm lens, other than for the framelines. ↑ In particular, Koyasu and Nawa would certainly have written it up if it existed. ↑ This and the other accessories listed here appear on pp.27 and following of a Japanese-language manual for the GL690 and GM670, dated June 1974. A photograph of the close-up attachment appears on Sebastien Lallement's main page; another on his page about lenses. ↑ Focal lengths: Nawa, p.262. In an advertisement for GM670 (Nippon Camera March 1974), the proportions of these frames seem to match 6×7 rather than 6×9. Neither this advertisement nor the manual for the GM670 and GL690 mentions the focal lengths or the 6×7/9 distinction. ↑ GN32: camera manual. Prices: advertisement for GM670, Nippon Camera March 1974. Kako: Nawa, p.262. Kean, L. and Goldberg, N. "Lab Report: Fujica G690." Popular Photography. April 1971, pp.100–101, 109. Rothschild, N. "First Look." Popular Photography. February 1970, pp.82–3. On the Fujica G690. Kawamata Masataku (川又正卓). Fujika G690 to Purauberu Makina 670 (フジカG690とプラウベルマキナ670, Fujica G690 and Plaubel Makina 670). Shashin Kōgyō, November 2003. Pp.60–63. Koyasu Yoshinobu (子安栄信). "Fuji Shashin Firumu no kamera no subete" (富士写真フィルムのカメラのすべて, All the cameras of Fuji Photo Film). Kamera Rebyū: Kurashikku Kamera Senka (カメラレビュー クラシックカメラ専科) / Camera Review: All about Historical Cameras no.44, December 1997. ISBN 4-257-13013-X. Tokushū: Fuji Shashin Firumu no kamera (特集：富士写真フィルムのカメラ, special issue on the cameras of Fuji Photo Film). Koyasu deals with these cameras on pp.68–9, 71. Nawa Hidetaka (那和秀峻). Meiki o tazunete: Sengo kokusan-kamera hiwa (名機を訪ねて：戦後国産カメラ秘話) / Revisiting renowned cameras. Tokyo: Nippon-kamera-sha, 2003. ISBN 4-8179-0011-3. Nawa devotes pp.255–71 to the G690 and its successors (including the fixed-lens models). Asahi Camera March 1969. Pp. 260–67. G690 and 100mm lens. Nippon Camera March 1974. Pp. 211–15. GM670 Professional. GM670 Professional, 100mm AE lens. Camera Mainichi April 1974. Pp. 172–9. GM670 Professional, 100mm AE lens, 50mm lens. Asahi Camera December 1974. Pp. 290–99. GM670 Professional, 100mm AE lens. Fujica G690 and its successors, formerly at Robert Monaghan's Medium Format Photography website (medfmt.8k.com: archived copy at the Internet Archive, 8 May 2006). The page at first appears to be about the G690 and its immediate successors, but in fact much of it is about the later, fixed-lens cameras. This page was last edited on 25 November 2016, at 20:20.